Why do Business Continuity Management? Discussion exploring the benefits of BCM confirmed by a number of sources including this year’s UK survey on BCM adoption by the CMI, which is co-sponsored by the BCI. It will also look at the reasons organisations give for not doing BCM and profile those that choose not to. The presentation will introduce a new concept of ‘informal’ BCM and will seek to characterise the tipping point that makes firms formalise their BCM thinking. The session will then debate strategies for increasing the adoption of BCM. 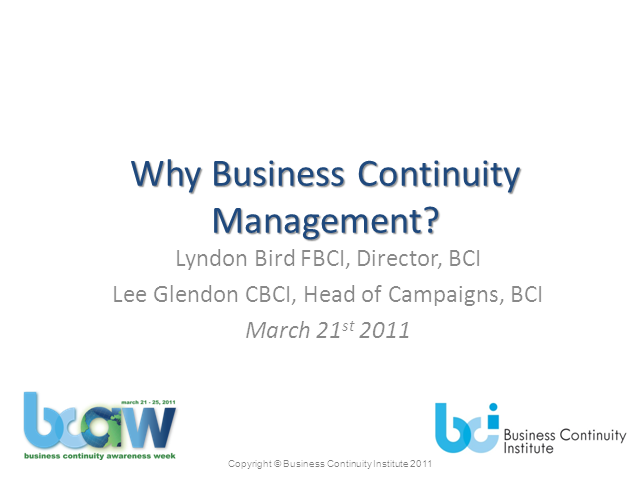 Title: Why do Business Continuity Management?